The Mid Atlantic Conference (also known as Mid Atlantic College Conference/ founded in 1912 as a track confernce) went through a number of transitions in name and also it's members throughout the years. 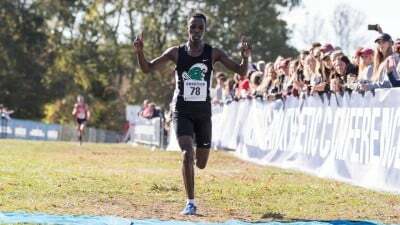 For the scope of Belmont Plateau Cross Country Hall of Fame coverage we will list the Champions of Cross Country list maily to the years where local teams from Philadelphia were members and/or Belmont Plateu was the venue for the championship race. Pre 1963, The MAC champion for cross country came from one race with all members competing for the one title. By 1963, the MAC had grown in membership to 30 teams, and the Championship race was divided with 2 Titles (University and College Division,) basted on size. This 2 Championship format lasted from 1963 to 1973. In 1974 there was a re configuring of the conferences with the smaller colleges staying in the MAC and the larger universities forming a new conference called the East Coast Conference (ECC). The MAC/ECC cross country championships where held primarally at Belmont Plateau (5.2 mile Classic Course) from 1963 to 1982. Once the bigger Philadelphia based teams (Temple and Saint Joseph) left the ECC, the championship moved up to the Lehigh course. The MAC conference championship s started moving away from Belmont Plateau after 1974. Listed below is the Champions list for the MAC/ECC when the race had Philadelphia based teams and also competed in the Philadelphia area (Cobbs Creek or Belmont Plateau Saint Joseph was a dominating team in the 1940s to 1960 and was led by Coach George Bertlesman. During the later time of the MAC/ECC at Belmont Plateau, Coach Artie Gulden built a powerhouse team at Bucknell University who dominated the 1970s and 1980s. Standout runners in the MAC/ECC where Johnny Kelly and Kevin Quinn (Saint Joseph) who won 2 titles each. Paul Minehan (2 titles/La Salle), Bill Mahoney (3 titles/Temple). Dominant runners in the 1970s and 80s from Bucknell where (George Buckeit /2 titles) and all time leader Bill Reifsnyder with 4 ECC Cross Country titles. Kevin Quinn and Mike Glavin went on to become long time coach at Saint Joseh University and George Buckheit still holds the Schulkill River 8.4 Mile Loop Run record (set in 1983) with a time of 40:03. Neil Weygandt is currently the second longest Boston Marathon consecutive streak with 44 straight Boston Marathons. Paul Minehan coached Bishop McDevitt HS to the Philadelphia Catholic XC Championship in 1970. *** Temple. La Salle and Saint Joseph had left the East Coast Conference by 1982 and the ECC's remaining members where Bucknell, Lehigh, Delaware, Rider, Lafayette, Townson, Drexel and American. **** The teams that had been part of the College Division in the 1960s and early 1970s remained in the MAC. The MAC was members where smaller colleges such as Haverford, Franklin & Marshall, Susquehanna, Ursinus, Swarthmore, Scrantion, Kings, Delaware Valley, Albright and Gettysburg. The Championship races for the MAC and ECC had left Belmont Plateau by the mid 1980s and contested at other venues.